If you heard a lot of construction noise this morning as we did, it was coming from yet another construction site in our neighborhood: 233-245 Spring Street, aka 20-24 Vandam, where an enormous crane (the full length of the block) was being installed. 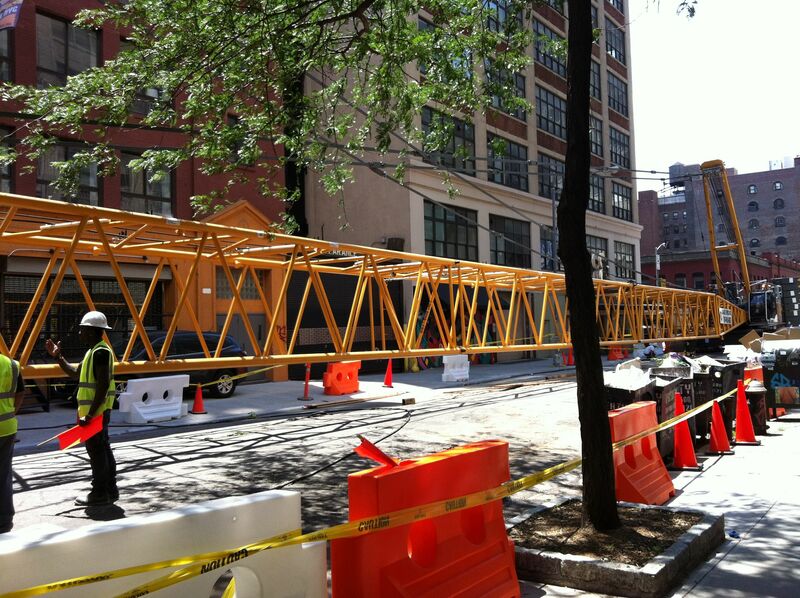 According to the Department of Buildings’ website, the crane is 409 feet long (35-40 stories tall). Their current crane permit runs through June 11, 2015, so this yellow tower and will be a fixture on Vandam for at least a year. This site is owned by Laurence Gluck’s Stellar Management, which plans to merge the 233 Spring Street building, home to the Aveda Institute, with 161 Sixth Avenue, and with two small neighboring parcels that a 24-foot by 100-foot vacant lot with 25,000 square feet of development rights. The new building is slated to be 18-stories tall. Our neighbors on Vandam and Charlton Streets, and at 188-192 Sixth Avenue, will be most severely impacted by this site, but the noise radiates over to Sullivan Street and to 160 Sixth as well. The page on the Department of Buildings website with information about permits for his site is here. The link to check if they have after hours variance permits is here. The location to note in 311 complaints is 233-245 Spring Street or 20-24 Vandam Street. If you do make complaints to 311 or Community Board 2, be sure to record them on the SVN noise complaint registry so we can have a record should we need to follow-up with the Department of Buildings or the Department of Environmental Protection. We owe this latest addition to the on-going disruption of our once quiet neighborhood to former Mayor Bloomberg and his yes-to-all-luxury-development City Council, who approved the Hudson Square rezoning last year without provide Historic District protections for our neighborhood. The Hudson Square rezoning allows residential buildings up to 290 feet on wide streets, and between 185 and 230 feet on side streets, depending upon the site, and on whether or not affordable housing is included. The fight to have the triangle below Houston—bordered by West Broadway, Sixth Avenue, and Canal Street—included in the South Village Historic District continues. According to the Greenwich Village Society for Historic Preservation, the current Landmarks Preservation Commission Chair has refused to consider the third and final phase of GVSHP’s proposed South Village Historic District in spite of a promise to do so in 2008. And while the GVSHP’s proposal to rezone the South Village to put in place height limits and eliminate the zoning bonus for construction of dorms and other university facilities has enjoyed strong support from Community Board #2, the City has thus not moved ahead. What you can do: Write to Mayor de Blasio and urge him to support expanded landmarks protections and rezoning of the entire South Village right away. Here’s a sample letter from our friends at GVSHP. Tell the Mayor what out-of-scale development is doing to your neighborhood. This entry was posted in Uncategorized and tagged after-hours variances, Hudson Square rezoning, Spring Street, Vandam Street on June 22, 2014 by southvillageneighbors.